King George County is the Gateway to the Northern Neck of Virginia. The county is the birthplace of President James Madison and home to Dahlgren Naval Surface Warfare Center. Nestled along US Route 301, the county is a mix of pastoral countryside with family-owned farms producing seasonal local produce, to technology firms and government contractors. It’s a small-town community with big-town appeal. 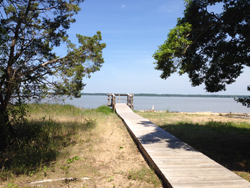 Caledon State Park is situated on 2579 acres of mature forest along the Potomac river. Iit is one of the best examples of an old, undisturbed, oak-tulip poplar-dominated virgin upland forest in the country. This park offers one of the few areas where bald eagles, a recently endangered bird, can nest peacefully.